Cortisone is the name used to describe a group of drugs commonly known as corticosteroids. Cortisone is used to treat pain in various parts of the body where inflammation is felt to be the cause of this pain. The reason why cortisone is effective in treating this pain is because it is a powerful anti-inflammatory. Please note this is NOT the same steroid as used by body builders. Other miscellaneous conditions where inflammation is a contributor to the pain, for example plantar fasciitis, frozen shoulder/adhesive capsulitis, Morton’s neuroma, ganglion cyst injections and Dupuytren’s contracture. Cortisone is injected under imaging guidance to allow accurate delivery to the area of interest. As for all medical procedures, there are risks associated with the administration of any medication, including cortisone. The chances of cortisone providing you with the benefit of pain relief in most patients outweighs the risk of experiencing any side effect(s) . The decision to inject cortisone is not taken lightly and is carefully made by your referring doctor and based on your diagnosis and past medical history. Sometimes where the diagnosis is not clear, a trial injection is given into the body region that is suspected of causing your pain. Yes. 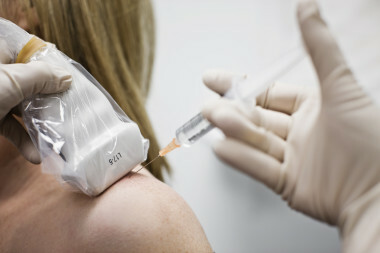 Since a cortisone injection is used for treating pain, it is an optional procedure. Other options should be discussed with your referring doctor and may include anti-inflammatory medications, exercise, physiotherapy and surgery. The role of our radiologist is to perform the procedure requested by your referring doctor and, therefore, ensure that the cortisone is injected safely and into the correct location. There is no scientifically proven limit for cortisone injections, however as a general rule, three injections into the same body part are permitted over a twelve month period. Injections more frequent than this are felt to place the injected tissue at risk of softening/weakening, which may be an issue in a joint for example, as this may accelerate arthritis. Also, if you have failed to respond to a series of three injections, then it is probably time your condition was reassessed to find out if the diagnosis is correct. If you do require more than three injections in a year, then the risk of the injection must be carefully balanced against the benefits of pain relief. Your referring doctor or the doctor at our clinic will be happy to discuss your condition and address any concerns that you may have.